Luang Prabang in Laos is emerging as one of Southeast Asia’s fastest growing tourist destinations, driving rapid passenger growth with services by at least four new airlines in 2016. Thai AirAsia will become the first LCC to serve Luang Prabang Airport in Mar-2016 as it launches flights from Bangkok, ending a long battle to gain access to the previously restricted Luang Prabang market. Malaysia AirAsia and HK Express are also planning to launch service to Luang Prabang, while Singapore Airlines regional subsidiary SilkAir is planning a new route from Singapore on a circular routing that also includes the capital Vientiane. The new SilkAir route is strategically important for the SIA Group as Laos is the only ASEAN country currently not served by any SIA Group airline. Vientiane had approximately twice the traffic of Luang Prabang in 2015, but Luang Prabang is the bigger tourist attraction and has tremendous growth potential. Luang Prabang completed an expansion project in 2012 which enabled the airport to accommodate jets, and the Lao government is now planning to expand the tiny international passenger terminal to meet surging demand. Laos is the second smallest international aviation market in Southeast Asia. Currently Laos has just under 50,000 weekly international seats, putting it slightly ahead of Brunei’s approximately 43,000 international seats and well behind the nearly 120,000 weekly international seats in the third smallest Southeast Asian market, Myanmar. Laos has experienced rapid growth over the last five years albeit on a very small base. 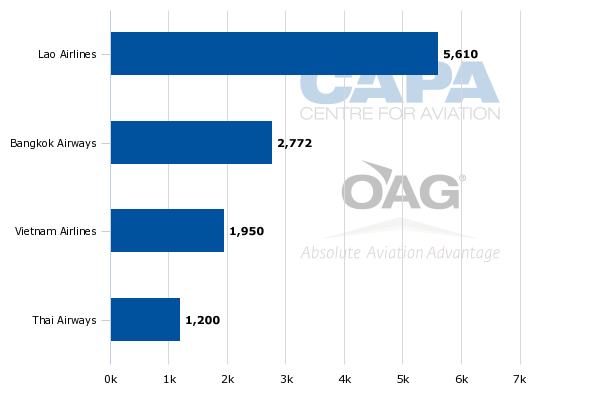 International seat capacity has more than doubled since 2011, with the fastest growth occurring in 2012 and 2013. However, growth has been relatively modest over the last two years. Current international seat capacity is up by only approximately 8% compared with Feb-2015, and approximately 15% compared with Feb-2014. Laos also recorded an 8% increase in international passenger traffic in 2015, to approximately 1.5 million passengers. This included approximately 1 million passengers at the capital Vientiane, which currently has 12 scheduled international routes and is served by eight foreign airlines, along with government-owned flag airline Lao Airlines. Vientiane currently accounts for slightly more than 70% of Laos’ international seat capacity with almost 35,000 weekly seats. Luang Prabang is the other main international airport in Laos, with approximately 11,500 weekly seats and service from three foreign airlines along with Lao Airlines. Pakse and Suvannahkhet are also designated as international airports, but are only served by Lao Airlines with limited services using turboprop aircraft. In this report CAPA will focus on Luang Prabang and the impact on international traffic as at least four more foreign airlines begin serving the increasingly popular tourist town. Luang Prabang only handled approximately 500,000 international passengers in 2015. There was a surge in international seat capacity at Luang Prabang in 2012 and 2013 following the completion of an airport upgrade project, but capacity has been relatively flat the last two years. Luang Prabang has large seasonal fluctuations as all the airlines serving the market add capacity for the peak northern winter season. Prior to 2012, Luang Prabang could only handle turboprop aircraft and had very limited apron space. Back in 2011 the airport had just four international routes, all of which were served by ATR 72 turboprops – Bangkok, Chiang Mai, Hanoi and Siem Reap. Lao Airlines has since launched services to Chengdu and Seoul with A320s, along with Jinghong in China using ATR 72s. The only other foreign airline serving Luang Prabang, Vietnam Airlines, continues to serve the market with an all-ATR 72 operation from Hanoi and Siem Reap. Lao Airlines competes against Vietnam Airlines on the Hanoi route and competes against Bangkok Airways and Thai Airways on the Bangkok route. Lao Airlines currently uses ATR 72s on both these routes, as well as to Chiang Mai in northern Thailand. Lao Airlines currently accounts for approximately two thirds of total international seat capacity at Luang Prabang. Bangkok Airways is the leading foreign airline with a 16% share of seat capacity, followed by Vietnam Airlines with 11% and Thai Airways with 7%. Bangkok Airways currently has two daily flights to Luang Prabang while Vietnam Airlines has 15 weekly frequencies and Thai Airways four weekly frequencies (based on schedules for the week commencing 15-Feb-2016). International capacity will increase dramatically at Luang Prabang in the coming months as four foreign airlines enter the market. Foreign airlines will likely provide more than 12,000 weekly seats in the Luang Prabang market by the end of 2016, compared with approximately 6,000 currently. Total international capacity could surpass 20,000 weekly seats, compared with approximately 11,500 in the current northern winter season, as Lao Airlines will also likely add capacity at Luang Prabang. The main driver of growth will come from new foreign airlines. The AirAsia Group will have the biggest impact, providing at least 3,600 weekly seats and giving Luang Prabang its first LCC option. On 9-Feb-2016 Thai AirAsia (TAA) confirmed plans to launch a daily flight from Bangkok Don Mueang to Luang Prabang from 24-Mar-2016. Securing permission from Lao authorities to serve the Bangkok-Luang Prabang route is a major breakthrough for AirAsia Group, which has tried for several years to gain access to Luang Prabang. Lao authorities have historically been reluctant to open up Luang Prabang to LCCs in an apparent attempt to avoid a large influx of visitors to the town, which is a UNESCO heritage centre. Laos seems to have adopted a new, more relaxed policy on LCCs and growth generally at Luang Prabang, as part of an overall initiative to boost tourism and improve connections with other ASEAN countries. The chairmanship of ASEAN, which rotates annually, is with Laos in 2016. AirAsia Group’s Malaysian subsidiary has served Vientiane since 2007, when Malaysia AirAsia (MAA) became the first LCC to serve Laos. Vientiane has historically been more open than Luang Prabang, and also attracted service from two Korean LCCs – initially from Jin Air, which launched service from Seoul in early 2012, and from T’Way, which joined Jin Air on the Seoul-Vientiane route in early 2015. However, Vientiane at times has been relatively restrictive, with several foreign airlines unable to secure the slots or traffic rights needed to mount new or additional flights. TAA has bas been seeking for several years to serve Bangkok-Vientiane, which is a much larger market than Kuala Lumpur-Vientiane, as well as Bangkok-Luang Prabang. With Vientiane TAA was repeatedly thwarted in efforts to secure traffic rights, while for Luang Prabang it faced a general policy restricting LCCs. For several years Thai Airways was designated as the only Thai airline for Bangkok-Vientiane, and when the route opened up to a second Thai airline in 2012 Bangkok Airways secured the rights over an application from TAA. At broadly the same time Thai Airways secured the rights as a second Thai airline for Bangkok-Luang Prabang. Thailand-Laos traffic rights seem no longer to be an issue as Laos adopts a more liberal stance towards ASEAN open skies. TAA is now planning to enter the Bangkok-Vientiane market in early 2017. Bangkok Airways, meanwhile, has submitted an application for a second daily frequency on Bangkok-Vientiane, which in theory should be approved, given the new more liberal policy adopted by the Lao government. Malaysia AirAsia also has filed an application to serve Luang Prabang from Kuala Lumpur. Lao authorities expect MAA to launch Kuala Lumpur-Luang Prabang in Jun-2016 with a less than daily service. MAA will likely serve Luang Prabang with three of four weekly frequencies, complementing its current thrice weekly service to Vientiane. While the AirAsia Group is keen to link its two largest hubs with both main international airports in Laos, daily services from TAA are more feasible since Thailand is a much larger market from Laos than Malaysia. In 2014 there were over two million visitor arrivals from Thailand compared with only 24,000 visitor arrivals from Malaysia, according to Laos Tourism Development Department data. HK Express has also stated that it plans to launch services to Luang Prabang by the end of 2016, providing Laos with its first non-stop link to Hong Kong and Luang Prabang with another LCC option. Hong Kong is a relatively small local market for Laos, but HK Express will be able to provide connections to larger North Asian source markets, including China, Korea and Japan. China is Laos’ third largest source market after Thailand and Vietnam, while South Korea is the fourth largest. Japan, Australia, France and the US are the next largest source markets for Laos and are approximately similar in size. While Thailand and Vietnam are the largest source markets, a majority of visitors from these countries cross into Laos by car, bus or train. In 2014 Laos recorded 4.2 million visitor arrivals but only 500 million of these visitors entered the country at one of its four international airports. SIA Group regional subsidiary SilkAir has also filed an application to serve Luang Prabang. Lao authorities expect SilkAir to launch three weekly flights to Laos in Jun-2016, on a circle routing that combines Vientiane and Luang Prabang. SilkAir will not have pick-up rights for the domestic sector. Adding Laos is strategically important for SilkAir and the SIA Group as it is now the only ASEAN country not served by SIA or SilkAir. MAA currently has the distinction of being the only airline serving all 10 ASEAN countries. Combining Luang Prabang and Vientiane in a circle routing is sensible for SilkAir as neither market is likely to be large enough to support a service on its own. SilkAir uses circle routings to serve other smaller Southeast Asian destinations such as Mandalay in Myanmar (combined with Yangon), Da Nang in Vietnam (combined with Siem Reap) and Davao in the Philippines (combined with Cebu). Singapore-Laos is a relatively small local market already served by Lao Airlines, which currently operates three weekly A320 flights from Vientiane to Singapore. In 2014, Laos recorded approximately 10,000 visitor arrivals from Singapore. The number of annual Lao residents visiting Singapore is similar. The Lao Airlines Singapore services originate in Luang Prabang providing a one-stop product in the Luang Prabang-Singapore market, but passengers must disembark and clear immigration in Vientiane. The new SilkAir flight will provide Luang Prabang-Singapore passengers with a new non-stop option in at least one direction, and for those flights stopping in Vientiane immigration can be cleared on arrival in Luang Prabang. While the local Singapore-Laos market is small, SilkAir and SIA will be able to offer connections beyond Singapore to larger source markets, including Australia and Europe. Currently most of these passengers now connect in Bangkok using Bangkok Airways and, to a lesser extent, Thai Airways. Bangkok Airways codeshares with several major European and Middle Eastern airlines along with Qantas and Japan Airlines, in many cases providing its partners their only offline access to Laos. Bangkok Airways is currently the third largest foreign airline in Laos – behind Thai Airways and Vietnam Airlines – but is the largest foreign airline in the Luang Prabang market. Bangkok Airways now operates two year-round flights on the Luang Prabang-Bangkok route. In 2014 it added capacity on the Bangkok-Luang Prabang route by upgrading its summer schedule from one to two ATR 72 daily frequencies, and its winter schedule from two ATR 72 daily frequencies to one ATR 72 flight and one A319 flight. In early Jan-2016 Bangkok Airways began selling, through GDS partners, three weekly ATR 72 flights from Chiang Mai to Luang Prabang commencing 28-Mar-2016. Bangkok Airways has since pulled these flights from the GDS and is no longer planning to launch this route in 2016. However, Bangkok Airways may reconsider the route and other opportunities for expansion at Luang Prabang since it will be keen to cement its position as the leading foreign airline in the Luang Prabang market as competition intensifies. Over the years Luang Prabang has been a profitable market for Bangkok Airways. Luang Prabang fits well with Bangkok Airways' boutique airline niche, specialising in small, or 'off the beaten path' but popular leisure destinations. Bangkok Airways will inevitably be impacted by the upcoming surge in new foreign airline capacity at Luang Prabang. SilkAir and SIA will offer a new option for European and Australian passengers while TAA’s entry will inevitably result in lower fares in the local Bangkok-Luang Prabang market. The AirAsia Group will also offer connections beyond Bangkok and Kuala Lumpur within Asia and to Australia, providing a new LCC one-stop option from Luang Prabang in markets that have traditionally been dominated by Bangkok Airways (and its partners). Thai Airways now offers similar connections but has had a relatively limited presence in the Luang Prabang market. Thai Airways only serves Luang Prabang on a less than daily seasonal basis, but could potentially upgrade Luang Prabang to a year round daily service as it hands the route to its regional subsidiary Thai Smile. Thai Smile aims to take over the Bangkok-Luang Prabang and Bangkok-Vientiane routes by the end of 2016 as it takes over the group’s A320 fleet, which is now split between Thai Airways and Thai Smile. Overcapacity is a concern for the short term, particularly given the small size of the Luang Prabang market. However, Luang Prabang is growing in popularity and the new flights should stimulate demand, particularly the new LCC options. Luang Prabang Province recorded 531,000 visitor arrivals in 2014, an increase of 14% compared with 2013 and 29% compared with 2012. Luang Prabang has huge potential for rapid growth. The biggest challenge is upgrading the infrastructure to cope with the growth while not impacting the town’s quaint character and charm. There is a limited supply of hotel rooms and the airport remains very small, despite the upgrade project that was completed in 2012. The international terminal has only two aerobridges and six check-in counters. As a result new flights have to be timed carefully, and airlines are not always able to offer their preferred schedules. Laos is now planning to upgrade the terminal to support the anticipated growth in passenger traffic. Initially developing a very small terminal was intentional as Laos was reluctant to encourage a surge in tourism at Luang Prabang. Laos will need to manage the expansion carefully to preserve its rich culture but with the right policies Laos should be able to benefit economically from rapid tourism growth without compromising on the beauty of Luang Prabang as a destination. The new, more liberal approach to supporting growth at Luang Prabang and finally opening the market to LCCs is sensible.